Many producers casually label their cattle operation a “program,” and it is such a deceptively simple word to throw around. However, years of focused work and research go into a true seedstock program, and this diligence defines the genetic value of the bulls you buy. If your provider is not pushing the performance limits of their herd, they are not upholding their end of the bargain. At Isa Beefmasters, we strive to push the performance envelope in every available manner. This may range from the time-tested practices as simple as weaning weights, to a much deeper dive into the latest technologies. We have always wondered how people could be in the genetics business if they don’t even take the most basic step of weighing their calves at weaning. To me, part of the fun of registered cattle is the ability to measure, benchmark and improve. By the time an Isa Beefmasters bull sells, he has been measured for 11 different data points. Together, this information tells us a great deal about his genetic potential and allows buyers to make highly informed selections. As BBU strives to add cow efficiency and fertility EPDs, we have responded by collecting cow weights at weaning and pregnancy check, which tell us a great deal about her productive efficiency. The fertility built into a herd is of paramount importance in selecting the genetics to improve your herd. Does your provider employ a defined breeding season of 90 days or less? 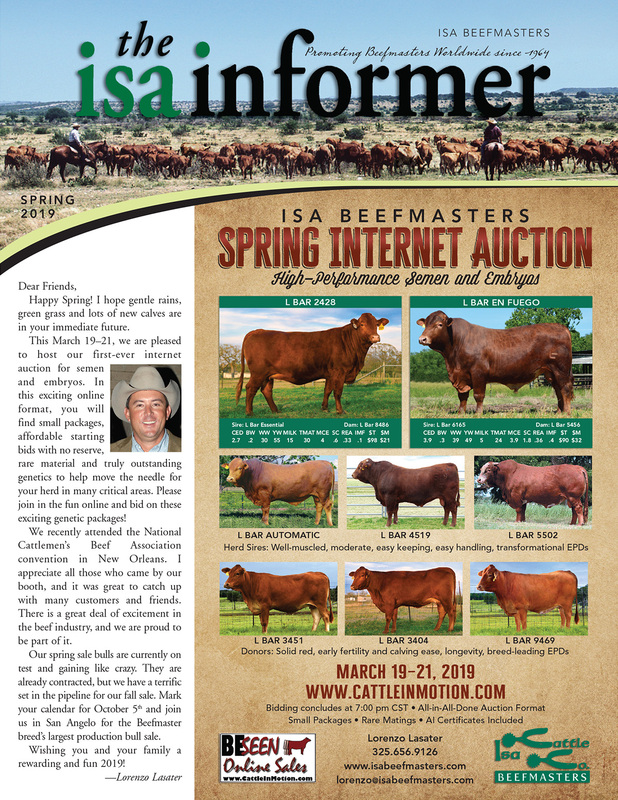 At Isa Beefmasters, we use a 60-day breeding season on both our fall- and spring-calving herds. We breed the heifers at 14 months old to calve on their second birthday, and then we require them to breed and wean a calf every year throughout their lifetime. Any cow that fails to do so is culled. Another area we emphasize in herdsire selection is the age of the dam: Bulls out of first-calf heifers or an older cow that has never missed pack a significant genetic punch. If your current provider is cutting corners—calving year-round, letting cows miss or holding heifers to breed later—think carefully about their commitment to herd fertility. Two geographic halves basically divide the U.S. cattle industry: farmer-feeders in the northern states and grass-ranchers in the southern states. While there is nothing wrong with either group, they clearly require different genetics for production success. At Isa Beefmasters, we run our herd outside, on grass, year-round, with minimal supplement—just as you probably do. We raise calves without creep feed so weaning weights are a true measure of a cow’s performance. The cow’s unique ability to convert grass to protein is what makes her the superstar of food production. As grass-ranchers, we must identify the genetics that can convert most effectively. 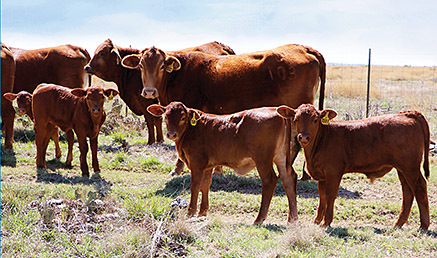 Though Beefmasters are thought of as heat-tolerant cattle—and they truly excel in harsh, hot conditions—they are actually very adaptable cattle. Our home base, San Angelo, Texas, is characterized by a dry climate, with extremely hot summers and fairly cold winters. Cows must be able to tolerate 110-degree summer days but also the occasional snow or ice storm with wind chills in the single digits Fahrenheit. We have a lot of success selling genetics throughout the tropical regions of the world because our cattle adapt so easily, but the nice little surprise is how well they also do in cold climates, such as our northern states. Health is another critical component of adaptability. Healthiness can take many forms such as insect resistance, respiratory health and resistance to infirmities such as pinkeye and foot rot. Ask anyone who has run both Beefmasters and other breeds, and they’ll tell you Beefmasters are exceptionally healthy cattle. 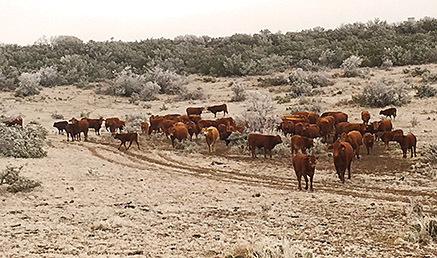 Their hardiness extends from the ranch to the beef chain, where the feeder calves enjoy exceptional health, a primary driver in profitability. I attribute this to more than 80 years of selection using the Six Essentials, which pinpoints hardier, healthier genetics. The bulls we sell undergo a unique, yearlong performance test. Our test is comprised of two gain test phases: one on grass and one on feed. These phases mimic the production cycle of a feeder calf and demonstrates a bull’s genetics for growth in each phase. 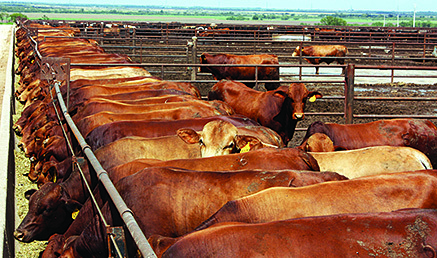 Many competing breeds are put on feed at weaning until they are sold. This “help” does a disservice both to the bull and to the buyer, masking the bull’s true capabilities. We do a yearling carcass sonogram on every animal we raise and have since the technology became available many years ago. This technology allows us to measure intramuscular fat (IMF), or marbling, and ribeye area (REA), or muscling, enabling us to select individuals that excel in these important drivers of carcass value. Isa Beefmasters recently put two sets of heifers through the Growsafe Feed Efficiency Test, which measures individual feed intake to give an indicator of feed efficiency, or conversion. I always knew in my heart that our Beefmasters were efficient cattle, but I think the results from the Genetic Development Center in Navasota, Texas, speak for themselves, with one of our heifers earning the #1 Feed Efficiency Index out of 335 head and 17 breeds. 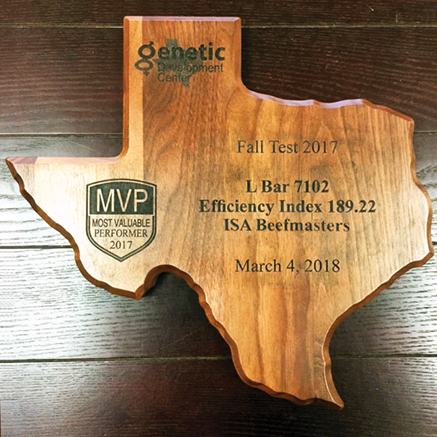 Isa Beefmasters also placed four of the top 10 individuals in the test for Efficiency Index and six of the top 11 for Residual Feed Intake (RFI). To have outperformed so many cattle in so many competing breeds is a wonderful validation of our cattle selection efforts over the past 80-plus years. Another facet of performance evaluation is DNA technology, which we have used for many years for sire identification, allowing us to breed in multiple-sire herds and still maintain accurate pedigrees. This multi-sire approach ensures accuracy when selecting for bull libido and their ability to breed in competition with other bulls, which is pretty unique among registered programs. DNA technology today has advanced to the point that we now have Genomic Enhanced EPDs. This new specificity layers DNA markers for various traits over the traditional phenotypic measurements, giving us greatly increased EPD accuracies in young cattle with no progeny. Genomic Enhanced EPDs ensure much greater predictability when selecting bulls to improve your herd genetically. In addition, the current DNA allows us to parent-verify both sire and dam, giving you total confidence in the pedigrees you are selecting. We are currently participating in several ongoing carcass progeny tests, validating our top sire lines’ strengths in gains, grade, yield and hardiness. Watch for these results to be published soon! As you can see, there is a great deal that goes into a “program,” and we constantly work to stay ahead of changes and innovations in the beef industry. We strive to test all our cattle for genetic value using every available technology, ensuring your investment in Isa Beefmaster genetics moves the needle in a positive direction for your herd. Stay up-to-date and receive your free subscription to the Isa Informer newsletter. Click here to sign-up, and we will start your subscription right away.